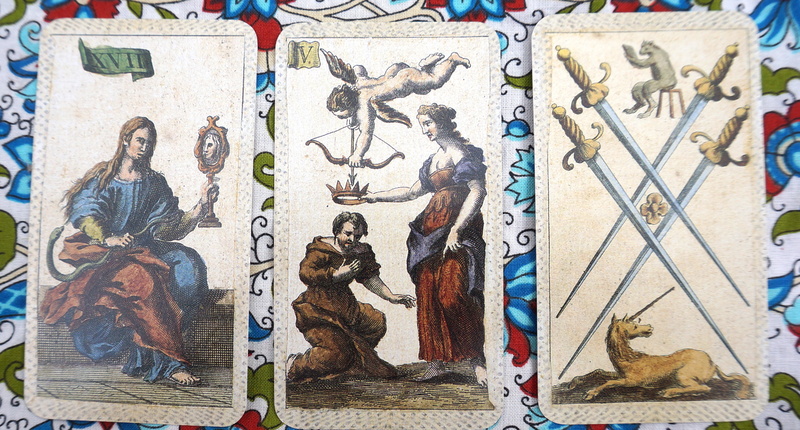 The Italian Minchiate Deck – May 2013 Horoscopes. 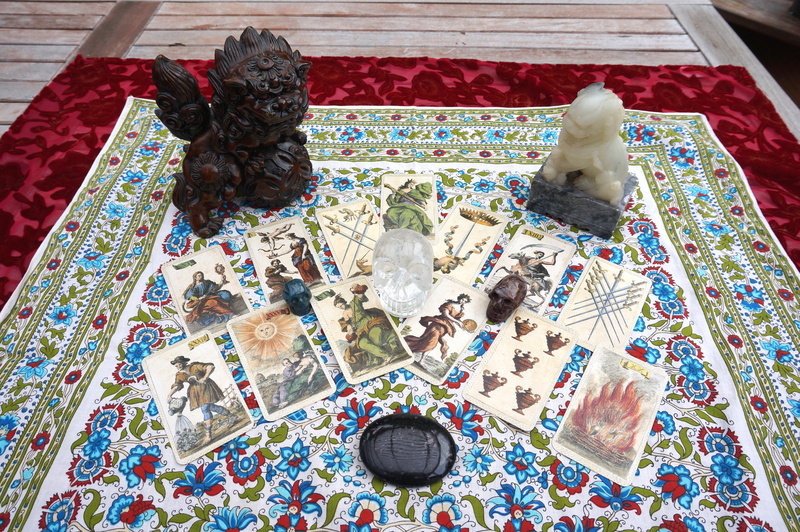 The Minchiate Tarot varies from a regular Tarot deck because it has 97 cards, not 84. 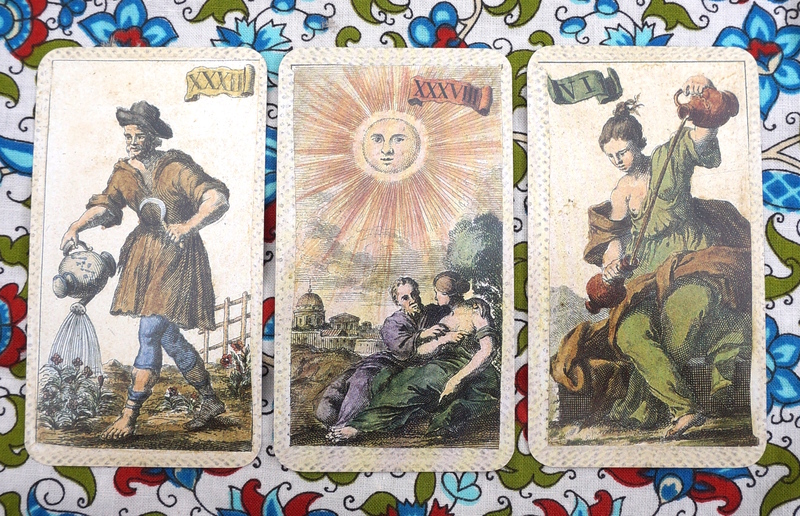 The extra cards are added to the Major Arcana. It includes the 12 astrological signs, the 4 elements, and 4 virtues, among others. The deck dates back to 18th Century Italy. 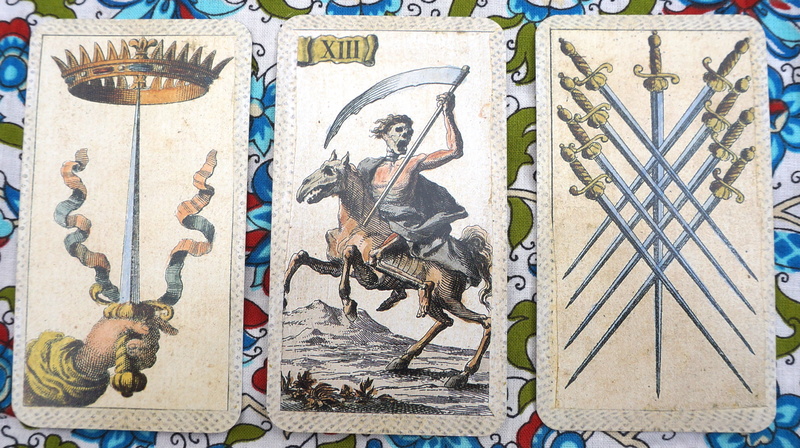 The cards are considered to have a light side and a dark side, depending on the situation. Don’t forget to check out the rest of ChristinethePsychic.com for upcoming events and classes. Want a reading, private or small group class, or party? Contact me at ChristinethePsychic@gmail.com for details. Enjoy May Day, and have a wonderful month as we turn towards the Light! 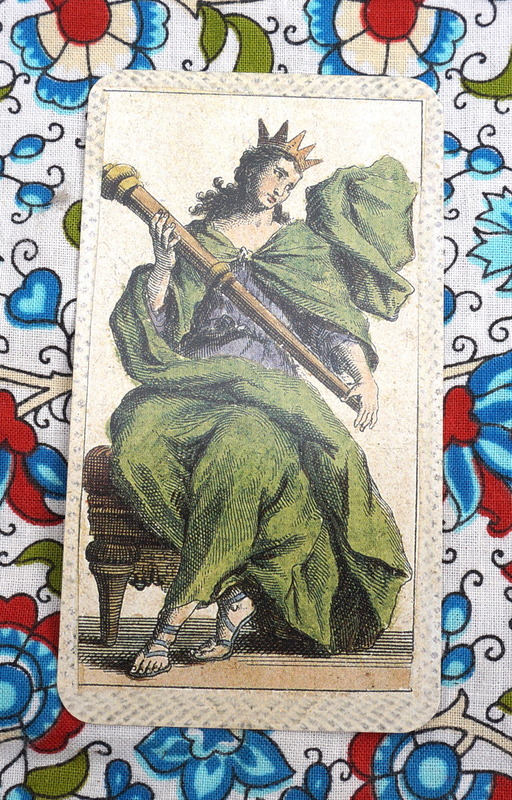 Like Claire Fraser from Outlander, the Queen of Wands both protects herself and shows her riches by the clouds and draping of voluminous fabric that surrounds her. She is the Queen of Luxury – the Luxury of knowing what it is that you want. She represents that burning passion within all of us, expressed in unusual ways. She looks regal and carries herself with ease, yet may become feral in a moment if threatened. We’re at the cusp of the shifting seasons from cold to warm, from darkness to light. It’s time to be honest with ourselves about the pros and cons of our deepest wishes. Prudence sometimes takes things way to seriously. In this card, she controls a snake, representing spiritual and medical knowledge, but also being able to see the world as a magical place. In her golden mirror, she can put a glamour over herself to gain anything she wants. When faced with such large amounts of power, Taurus, it is you who decide which face you will show to the world. Sometimes we just want to be admired, other times we just want to get ahead. Be prudent—it’s better to be your true self at work, or in relationships and let the chips fall where they may. the glamour will get you everywhere you’d like—but you ultimately have more power and will be more successful in love if you be yourself. Gemini, have you asked Cupid to shoot his bow? Are you ready for a proposal or another big life event with your partner? Now is the time to move forward in romantic relationships whether you are partnered or not. Know that in order to get what you want in a relationship, you must be precise. Know your deal breakers, know your must haves versus “would like to haves.” Be careful. Take action, but Cupid shoot his bow for you—if you force the issue, you’ll be wondering for years if this is really the right person. Use the Law of Attraction to bring your loved one closer—or even a best friend, if that’s what you need. Let harmony in your relationships surround you—and if there’s issues at work, get a piece of jasper in your favorite color for your desk. Thought, balance, stability. Cancer, this is your charge for the month. It’s time to bone up on information in order to make the right decisions in the month ahead. While this might sound a little lonely—take hope: you are not alone. The mystical unicorn helps you keep your eyes on the prize and your wishes pure. Know that you are being supported from the other side. This is a good time to research colleges or educational opportunities for yourself or your children. Spirit is supporting you in a new endeavor that defies gravity. The ribbons tied to your sword float, mid-air, as does your crown of victory. As long as you think things through before making your moves, you’re in for a lot of positive change this month. This is a good time for you to work on the Law of Attraction to manifest your desires, as they will appear more quickly that you may expect. The barriers that held you back are down! It’s time to move ahead, especially when it comes to training, leadership, or job opportunities. Your new way of thought will also bring your friends (old or new) closer to you so that you can enjoy this time, Leo. It’s time for a change. For many, it’s getting to be the end of the school year; for others the seasons are finally starting to shift so that the cold weather remains at bay. If you could erase some of the worst events in your life in the past year and start over, what would you do? It’s time to clear out anyone or anything that brings in negativity or brings you down. By having a controlled fire, you pave the way for a fantastic summer by getting rid of the old and making way for the new. Now is a great time to clean out your closet, old books, files, whatever. Make room for the new to come in and play. Start dreaming so you know what to keep. This is a time for celebration. This is the end of a long road paved with stones of your hard work, toil, labors. It’s time to appreciate what you’ve accomplished and not worry about overthinking the future. June will be a clean slate for you—the problems that have poked and prodded at you—nibbling like ducks—they are ready to go on their merry way! If you feel burdened with any problems right now, this is the month to step away form it all and take a break form your worries, even if just for a weekend. Change your environment and give yourself a break. This will allow new energy in to change your finances or your relationships—or both. It’s funny that your are showing up as Aquarius this month, Scorpio! What can you learn from Aquarius? There are a couple of things that will help you. First of all—if you’re in a relationship with or have a family member that is an Aquarius, it’s time to pay more attention to that relationship—invest in it. Second, this is the month where you finally have the big picture. You’ve been working on your home life and making peace with your family scars. You’re getting ready to shift your beliefs and energy around the stories you tell about yourself. It’s time to grow flowers instead of cacti, because now you are strong enough to do so. If you’re getting over a broken heart over a loved one or another negative situation, know that you will be given, in abundance, the support for a new start. Reach out to family and friends for support—and sell them your new version of yourself—they are buying. You will gain peace and contentment. Ah, Capricorn—you always are in need of more fun. You have this skill of discernment. Of focus. Of connections. Of seeing what others do not or can not. Instead of using up all of your focus at work, it’s time to use your mad skills to bring joy into your life. What will it be? A couple’s salsa class? Braving a speed dating night with your BFF? Planning a vacation on a tropical island? Or having a barbecue surrounded by friends and learning to make a brisket from scratch? It’s time to feed your joy, Capricorn. You’ve used your concentration for the Man, now use some of it for yourself! You deserve it. Although your emotions swirl around you, Aquarius, you are coming to a new understanding and appreciation of money and what it brings. Instead of setting money on a pedestal above you, you now know how to work in partnership with it. You will discover additional information, if needed, that will assist you or your children in successfully moving along their chosen career path—especially if involved in creative careers or entrepreneurship. If you’re happy where you are, career-wise, take a little time to see if there’s a way you can put an entrepreneurial twist on your work to change the way you’ve been doing things, and to reach your intended audience. Know that you will she enough. You will be sustained. If you’re not there yet, know it’s coming one day at a time, and that you will have enough to share with those around you, to give back part of the love and support you’ve received form those around you. If you can mentor someone, so much the better. Five beautiful urns sit before you—which will you choose? How do you know what’s under their lids? To move forward din your romantic life and close relationships, it’s time to look at how you view yourself when you’re in a relationship. Do you consider yourself a victim? Do you consider yourself to be the strong one? Or the secure one? Or, do you always rescue the person in distress. Now is the time to assess, to stop crying vow spilled milk. You will be given the keys to rapid emotional growth and liberation. It can’t be done alone. You’ll need to assess yourself and then check with a few people you trust to see if how you view yourself and your attitudes about relationships. So many beautiful souls try to sabotage their love relationships because they are afraid of being hurt—or are even scared they won’t know what to do with success. Know that you are worthy of love, and that you will find love—whether you want to or not! Once you stop spilling milk (and/or crying over it), you can refill these milk urns with honey pots and attract a wonderful, warm mate. 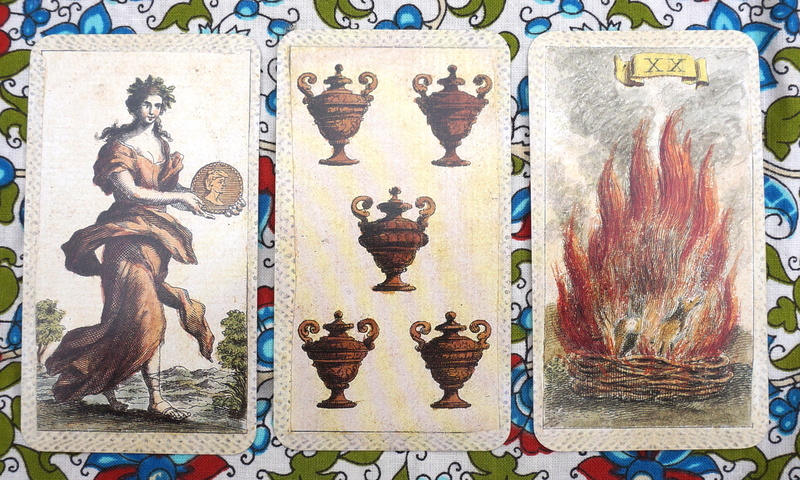 Aries, your card shows an animal standing within a bonfire, immune to its flames. You often have a headstrong nature, Aries. It can save yourself and those around you from a terrible situation, it can guide you to your true passions and dreams—or, it can be you over reacting and getting hot-headed! Notice the gaze of the animal in the flames — s/he is at peace with the situation. You are a powerful agent for change, and those around you will often follow. It’s time to make the decisions that will feed your passions and joys—but keep this in balance with your role of leader. What you do, others will follow. Which of your passions do you want to leave behind as your legacy? Your teaching or mentoring? A large joyful family and numerous descendants? A cleaner environment? That book you’ve always been meaning to write? What will feed you while you watch the flames clean out all the old, providing you with new opportunities across the spectrum. Especially in love, family, career. Sending May Flowers, Joy, & Light to You and Your Guides! This entry was posted in Tarot/Horoscope and tagged angels, Austin, Christine Linial, Etruscan, Etruscia, horoscope, Minchiate, psychic, tarot on April 28, 2015 by christinethepsychic.